Lincourt embodies the casual graciousness of Santa Barbara. The winery began when Proprietor Bill Foley fell in love with the rugged coastline, picturesque towns and camouflaged hills of Santa Barbara County. Named for his two daughters, Lindsay and Courtney, Lincourt wines express the elegant complexity of the estate vineyards in the premier Sta. Rita Hills AVA. Under the watchful eye of winemaker Lorna Kreutz, the estate vineyards feature Rancho Santa Rosa Vineyard East and West. Its core offerings include Rancho Santa Rosa Pinot Noir, Rancho Santa Rosa Chardonnay, Steel Chardonnay, Sauvignon Blanc and Cabernet Sauvignon. These vineyards are farmed “vine by vine,” with Kreutz taking the best blocks (or rows) of grapes to create each wine. In addition to their core wines, they produce small quantities of special bottlings for club members and visitors to the tasting room located just outside of Solvang. Lincourt Vineyards also practices sustainable farming techniques in order to ensure the highest quality of wine from grape to glass. Drawing from years of experience working for wineries throughout California, Kreutz shares Foley’s commitment to quality winemaking. Each wine is aged with the focus on creating wines that exemplify the unique terroir and varietal-rich flavors. 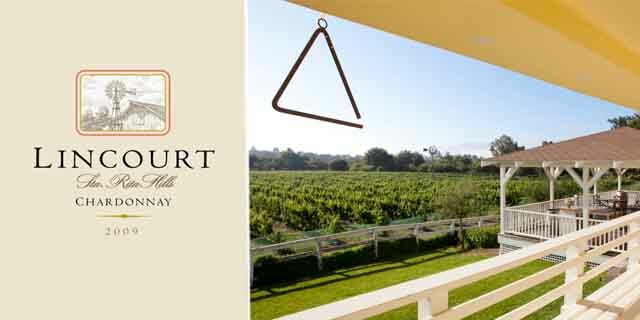 As you arrive at Lincourt, the iconic windmill that graces each of their wine labels will greet you as you enter the old farmhouse. The relaxing atmosphere and beautiful property offer something for the whole family – wine tasting, picnicking or enjoying a bottle as you bask in the beauty of the Sta. Rita Hills.